I sewed and quilted this wall hanging in only two days, thanks to the kit available here. The kit comes with the salmon appliqué already cut and backed with double-sized thermo-bond. All I had to do was cut the pieces for the heads, since I wanted them a different color. A hot iron temporarily affixed the salmon pieces to the background. I used metallic thread to freehand quilt the salmon and water-themed freestyle designs onto the background. I was able to use stash fabric for the backing, and for once, the thread didn’t break continuously as I was quilting – probably because I bought a sewing machine needle specifically for metallic threads, and I kept my pace slow and measured. This is the start of my Christmas gifts stockpile – between now and December, I have a long list of projects to work through! This time of year always brings a flood of projects to be given as thank-yous and goodbyes to the many teachers and coaches in my children’s lives. This quilt is a farewell gift to the dance instructor who has taught them for many years in their theatre program. The center panel is cut from one of the girls’ old program t-shirts. Initially, I was going to make the quilt out of diagonal blocks of white and yellow (these are the program colors, along with black) but instead, I chose to go with something more colorful. I used different solids and a single white fabric from my stash to create a rainbow effect. To quilt it, I stitched four diagonal lines radiating from the corners of the center block. Then I measured halfway between each line and stitched, then halfway between each of those lines and stitched again. The effect is that of evenly spaced lines radiating out from the center. At Springwater, the classes aren’t referred to by grade, but instead by their mascot names – Dragonflies, Salmon, Blue Herons, River Otters, Foxes. Each class has a symbol and a color, printed on t-shirts, and the kids wear these t-shirts on Friday Field Studies, field trips, special all-school events, etc. As a graduation gift, I cut up all of Emmersen’s old t-shirts and sewed them in order, from youngest to oldest, into a quilt. For the back side, I did the same thing with her zoo camp t-shirts — she’s gone to the Oregon Zoo’s summer camp every year since 1st grade, as well, and has now aged out, but it was always her favorite camp, year after year. Like Springwater, the zoo camps helped foster and develop her love of wildlife, nature, and the environmental sciences. So, I thought it was a fitting backing for the graduation quilt. The t-shirt material is a little challenging to sew with, because it’s a knit; someone originally recommended that I use knitted interfacing, but after giving that some thought, I disagreed because I wanted more of a stabilizer. So I went with a mid weight fusible interfacing. Then I used leftover fabric from this project as the sashing and binding. The quilting was a little challenging because I didn’t want to quilt through the middle of any of the t-shirt squares on either side of the quilt, so in the end, I went with vertical quilting down the sides of the sashing on either long end, and then I sewed a bar tack in the middle of each square, just to secure things down a little more. This quilt was made for a custom order off my Esty site, for a client who chose the colors for a more masculine look to the quilt. I used Violet Craft’s Waterfront Park prints in black and clementine (1 yard of the Bridgetown and 1/2 yard of the remaining fabrics), along with Robert Kaufman Brussels Washer Yarn Dye in black (2 yards) and Kona Cotton in a shade of white (3 yards). The back was pieced together with remaining Bridgetown, Brussels Washer, and white cotton. I used a simple quilting pattern of horizontal straight-line quilting, and bound the quilt with my remaining Brussels Washer. I bought a packet of eight fat quarters of Andover Textured Solids shot cotton when I visited the Stitchin Post in Sisters this summer. As much as I love blues, I’m always drawn to these warm hues of pinks, purples, and peachy-oranges. The fat quarters have sat on my sewing table for months, waiting for inspiration. It’s funny how you have no idea what to make with a certain fabric, and then, all of a sudden, if you wait long enough and leave enough space for ideas to trickle in, you are inspired! To make this quilt, I cut the fat quarters in 4.5″ x 7″ blocks (totaling 96 blocks). I laid them out 12 down x 8 across, and sewed them together in strips, with 80 white 7″ x 3.5″ blocks in between. Then I cut 2.5″ wide strips and pieced the rows together. Unfortunately, my math wasn’t perfect, and it ended up longer than I had anticipated; I sewed 5.5″ wide strips in the vertical sides, to make the quilt 63″ wide (perfect for a twin-sized quilt), but even with only 2.5″ wide strips on the top and bottom, the quilt ended up 104″ long – almost 10″ too long on each side for a twin-sized quilt! However, I couldn’t bear to cut it down, so I figured that you could tuck the extra length over each end of the bed, or use the length to go over the pillows at the head of the bed. For the back, I had two 2-yard pieces of shot cotton in some of the exact same colors, so I split and sewed those together for a middle panel, framed on either side by white cotton. I wanted a quilting pattern that juxtaposed against the “squareness” of the quilt layout, so I used a straight-edge to draw sunburst lines from the center of the quilt – not too many, just enough to secure even the outside edges, where the sunburst lines were the widest. I was really happy with both how this quilting looked, and the fact that it didn’t take long at all. I finished it off with simple white cotton binding. I think that the final product shows off the colors beautifully, although you do lose a little bit of the impact of the cool texture of shot cotton – I need to find other sewing projects (maybe clothes?) 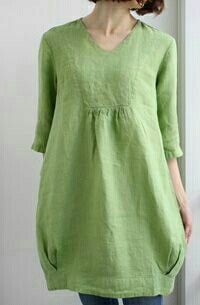 that really take advantage of this beautiful, soft fabric that has such a nice drape and sheen. What do you think – would you put a quilt like this on your bed? I found this collection of beautiful fabrics – Winter’s Lane by Kate & Birdie Paper Co – at Bolt, one of our wonderful local fabric stores, and figured that even without a quilt design in mind, I could come up with something on the fly. As with many fabrics like this that are so striking in their own right, I was loath to cut them into small pieces, so I used large blocks of the prints, accented with small color-coordinated blocks from my fabric stash. Instead of creating a design for the backing, I used simple red flannel, which I think makes the quilt cozier and more in the spirit of winter. I used the same flannel for binding, as well. In order to trim up the quilt, I took approx 1″ off all the way around, so the final dimensions are approx. 50″ square. I really like this size of quilt, but I worry that it’s not too functional – obviously, it can’t be used as a bedspread. I think it’s ideal for a lap blanket or a quilt over the back of a couch or chair, but is that how most people use their quilts? I don’t know whether it would make my FOs more user-friendly if I made them all bed-spread size – I guess I hate that because then they have to be so vertically oriented, so much longer than wider, that it really dictates what design you can use. Any quilters out there: How do you design what dimensions to make your quilt designs? I’ve been slow with my postings the last few weeks, probably because I’ve had bigger, more time-consuming projects in the works. I just finished two twin-size Ed Emberley quilts, custom-ordered by an Etsy customer. They are similar, but not identical – I created “frames” for each of the Emberley prints, and then randomly scattered the frames throughout the white pieced quilt fronts. It’s amazing how much more time it takes to cut and sew strips for this kind of random placement, than for blocks that are all the same size and shape! Here’s the front and back of the first quilt – I tried a different way to quilt it by stitching freehand squares around each frame, one inside the next, and so on. You can really size the quilting lines on the back (which I like). I didn’t want just a solid-colored backing, so I stuck with the white cotton but used leftover Emberley prints to create a single “line” down the middle. I initially intended for the line to run horizontally, but I purchased 90″-wide fabric, so it was easier to cut and piece the line in vertically. Here’s the front and back of the second quilt – my quilting on this one consisted of randomly-spaced vertical lines. I used one of the frames to start each line off, then ran in straight top to bottom. I really like making custom-order quilts, because I know from the start that the finished product is exactly what the intended recipient has in mind! 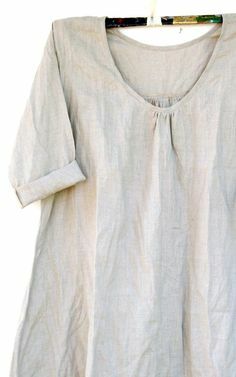 I love the tones and texture of this fabric, and the clean, modern look of keeping it simple. The fabric is Andover Textured Solids in fat quarters of amethyst, hyacinth, laguna, galaxy, peacock, ripple, envy, and toxic. 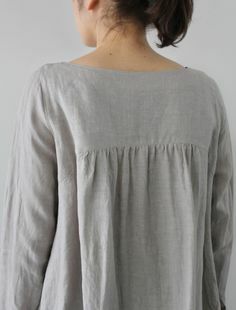 This fabric is amazing – it has almost a looseweave linen-type texture that made me want to reconsider using it in a quilt and sew it into skirts and blouses, instead. The quilt is approx 50″ square, backed and bound with Robert Kaufman’s Interweave Chambray in color Wisteria. At first, I couldn’t decide how to quilt it – that is, whether to break with the vertical patterning, or echo it with the quilting. I always agonize over the quilting pattern, it’s so difficult for me to visualize what it will look like when it’s done! In this case, I chose the latter, and was really happy with my decision. So as to not over-emphasize the quilting, I bought threads to match each of the color blocks, then freehand quilted vertical lines paralleling the blocks approx 1.5″ apart. I’m not sure that this size and shape of quilt is very useful – it would work well as a wall hanging, I suppose, but not so well on a bed, and maybe a little short for a throw? But I do like how the dimensions show off the blocks of color. When I read that these fabrics were inspired by the Portland waterfront – one of my favorite places to run, bike, and admire all the bridges – I knew I had to put them to some use. I think it’s actually harder to create a quilt when your focus is on the fabrics, because you don’t want to cut them up into small pieces – you want to admire them whole cloth! But, of course, the point of a quilt is piecing together small bits of cloth . . . The fabric is from Violet Craft’s Waterfront Park collection, in colors breeze, navy, and clementine. 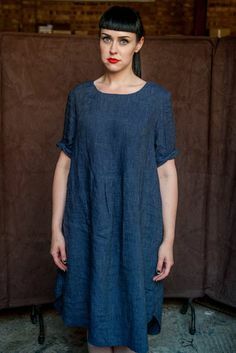 I used Robert Kaufman’s Brussels Washer Yarn-Dye, in color denim as the outer border – this is gorgeous fabric, I love the variations in the dye and how soft it is. I used white fabric from my stash to sash and bind the quilt. My favorite block is Bridgetown – the design is based on each of Portland’s many bridges that span the Willamette River. I can recognize and name each one of them! The yard of Brussels Washer was just the tiniest bit too short to finish up the border, so I used a bit of the leftover Bridgetown to finish off the upper right corner – I think it looks like I meant to do it! For the backing, I like to use up the remainder of the fabrics from the front – it creates a quilt that is almost two-sided, and it keeps my leftover fabrics stash from becoming too huge 🙂 I cut apart the remaining fabrics in whatever widths each dictated in order to span the entire length of the quilt. Then, I used the remaining small pieces to piece together one long row . I measured these all, figured out what additional length I needed, and cut 3.5″ white strips to piece in between. The quilt is sized for a twin-size bed, which makes it approx 72″ x 90″. My one dissatisfaction with the FO is that I didn’t get it cut as straight as I would have liked, so the border at the top came out looking crooked. I told myself that it gave the quilt a more modern bent to have the inner frame a little off-kilter from the outer frame. I quilted it by stitching straight lines diagonally through each of the large blocks, then I freehand quilted in the border. How to quilt is always a difficult question for me – I want the design to add to, not detract from, the pieced pattern. I usually end up dissatisfied with my choice of quilting pattern – when the focus is on the fabric, not the finished design of the FO, it’s hard to come up with a quilting pattern that complements or accentuates the fabric patterns. I’ve had this fabric in my stash for a while now – I wish I could remember what it’s called or where I ordered it from, but at the time, I remember ordering the entire run of colors in fat quarters, thinking that I would eventually come up with a project for them . . . they’re great as substitutes for solids, but I wanted a design that would showcase all of them together. The predominant colors were blues, reminding me of the sky, and pinks/oranges/yellows, reminding me of summer flowers, and so the idea for this quilt was born. I used different sized strips (from 1″ to 3″) of browns, and then blues, to create the body of the quilt. When I started in on the blues, I had to intersperse green squares for the stems, and I had to plan where they would go so that they would connect, but not in completely straight lines. I thought initially of putting the stems on with appliqué, but I wanted the entire quit except for the flowers to be strip-pieced, so I went this direction, instead. After I’d gotten my stems long enough, I switched to only blues in the strips, working my way up to the darker blues as I got higher and higher into the sky. Once the strip piecing was done, I drew myself a petal template in two different sizes and cut out the flower petals from the pinks, reds, oranges, and yellows. I put them together in different design and color combinations, added pinking sheared-circles for centers, and glued them down before zigzag stitching around all of the borders. For the backing, I used leftovers from the flower colors to create a rainbow effect down the center of the back. I kept the quilting simple, outlining the flowers, freestyle quilting clouds in the blue sky, and then stars in the darker blue upper reaches of the sky. In the brown “dirt” section, I quilted wavy lines that followed (but not exactly) the strips. The finished size is only approx 40″ square, so it’s ideal for a wall hanging. If you’ve read my blog in the past, you know that I’ve been working on this project for months; I finally finished all of the embroidery blocks, and after all that work, putting the blocks together into a quilt was the easiest part of the entire project. Each block had a different size and shape, so I followed the layout from Crabapple Hill Studios when sewing them together. I decided I wanted the quilt to be approximately twin-sized, so I added white borders 5-7″ wide to give me the right height and length dimensions. I wanted some kind of rainbow effect as the backing, so I used stash fabric to create a “rainbow runner” down the back. Finally, I wanted to keep the quilting very simple, so as not to distract from the embroidery. I used a zigzag stitch and stitched over each of the seams between the blocks. I liked the zigzag better than just stitching in the ditch, because it shows up more and creates some demarcation between each block. The finished quilt is absolutely gorgeous, but not something I would want to put on a bed, because the hand embroidery is so easy to snag. I’ve decided to hang it on one of our huge walls, where people will walk by and be able to appreciate the fine detail of the design and the work right at eye level. This quilt is built from Robert Kaufman’s Railroad Denim fabrics – one half-yard each of Micro Stripe Indigo, Herringbone Indigo, Slub Stripe Denim, Deluxe Thin Stripe Denim, and Fine Stripe Indigo. These fabrics each differ in feel, weight, and appearance – I initially was going to try to sew a skirt or pants, but I loved them all together, so I turned to a quilt, instead. The solid white is one yard of Robert Kaufman’s Brussels Washer (color White) – this fabric feels amazing, and I love the subtle texture. I would definitely use this whenever I could as my white solid, it has so much more flair than just a plain white cotton! In order to best show off the fabrics, I decided to keep them in large blocks – I had two different ideas for the layout of the blocks, so I made a two-sided quilt. I suppose that the side with the white blocks is technically the front, since that’s the side I quilted on, but you can truly use either side and it looks like it’s “supposed” to be the front. I built my piecing pattern around the concept of using up every scrap of the fabrics, and I just about made it – maybe just a few tiny pieces leftover. I quilted the white blocks with freehand squares – one inside the other, inside the other, until I ran out of space. I used the same concept on the denim blocks, but only two larger squares, because I didn’t want the quilting to overwhelm the fabric. The finished quilt is a little smaller than twin-sized – I’d say approx 60″ wide x 75″ long. A good size for a lap quilt, or to hang on a wall, or to cover a bed. 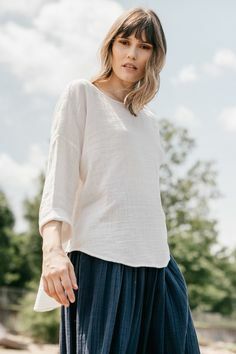 I’m not sure I’m really satisfied with the finished product – it’s one of those situations where I loved the fabrics so much, I wanted to best utilize them, but I couldn’t come up with any idea that I thought really did them justice. I hate that feeling, when you have a great starting point – fabric or yarn or whatever – but you just can’t decide what to do with it, and it seems like no matter what I decide on, I’m left feeling vaguely dissatisfied. I wonder if other people feel that way when they’re crafting without a pattern or directions to guide them? I made a second raindrops quilt as a custom order for an Etsy customer – this one is a little larger than the original, approximately 50″ x 60″. The front is Robert Kaufman Brussels Washer Yarn Dye, wide width (color Grey), which I absolutely LOVE – so soft! The backing is Riley Blake Designs Cotton Shades (Vintage Blue) – it’s not as wide as the Brussels, so I had to use some grey ombre from my stash to add to the width. I used stash fabric in different shades of blue, cut out raindrop shapes freehand, then used quilting pencil to draw the rain lines vertically down the quilt front, with occasional raindrops “dripping” from the lines. I glued down the cut-out raindrops randomly, over some (but not all) of the drawn raindrops, then I machine sewed down the raindrops, with edges exposed. This way, as the quilt is washed again and again, the edges will fray softly. Next, I basted the quilt layers together, then machine quilted over the pencil lines and drawn raindrops with white thread. I used blue stash fabric for the binding to complete the quilt.